Failed sometimes or many times in life? YES. We all fail. Failures are part of life. 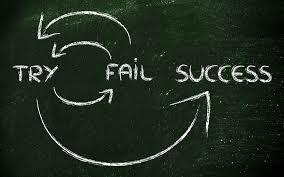 You should fail to achieve success. Till the time you won’t fail, success also won’t come to you. What is important is that you get up and try again till the time you don’t reach your goal. Trying again is essential. Do not quit. Do not accept failure soon. Do not get discourage and don’t get tired. Sometimes in life you may give your best and still fail. That will be time you will be disappointed and won’t feel like trying again. But be positive. You have to find a way out. Because its ok to fall but don’t forget that you have to get up as well. The more mistakes you make, the more you will learn. You will experience life the best with your learnings. Do not stop trying. The ultimate purpose of life is to get up strong always so that you don’t fall in your own eyes. Keep your faith and determination high. Trying is important. Many people don’t even try. And the chances you let go now, will be remembered by you life long. And regrets are painful. There will be people who will laugh at you for trying and not succeeding every time. But that should not affect you. Work so well that they even broadcast your success. Do not waste your time and days. Make the most out of your time. Do not take anything granted in life. Work everyday so well that you are always one step ahead to reach your final destination. And see how happy you will be after achieving it. People who try are real heroes. Be the hero of your life. Do not worry about what can go wrong. Wrong will also become right one day. Work hard for this right day to come in your life. Your failure should inspire you always. Do not take the failures to your heart and get disappointed.Be a strong person and always believe that You can do it. Do not lose the chances, Take the chances. Take your chance and risk now. It is any day better than even trying. Always remember that you have to prove yourself and don’t forget the people who are watching you. You have to be great and not fall in your own eyes. But at the same time you have to make your place in society. Let people and your enemies know that who you are. Work hard for them. Let your success make the noise. Fear for not taking chances. Fear for being in the same place next year. And that fear will make you work hard. Fear is important for the success. You are the one who has to remove the black clouds in your life. Do not let your dreams fade away. One day you will be happy when you have done it. Go ahead and be ready to enjoy your success through failures.